Courses at The Croquet Academy at Sussex County Croquet Club in the 2016 season are now open for entry. You can see the full prospectus on this website here. There have been some website security updates installed and a few adjustments to the look of the site. Also improved the experience on a smartphone. The annual high bisque tournament remains a popular Academy event. This year we had 19 entries only – 1 late withdrawal and a clash with Hurlingham seemed to affect numbers. The High Bisque Salver was contested by 10 players with some excellent croquet and sporting games. The winner after a close contest was Chris Rolph who beat Chris Coull in the final +6. Both players had deserved handicap changes as did Deborah Marcus. We were pleased to see some newcomers and hope they enjoyed the play. The Supervised group was ably managed by Katharine Minchin assisted by her team of coaches. The higher bisquers played some 14 point games with supervision and as ever the coaching and advice was well received. The Club provided delicious lunches and we are grateful to all the volunteers from the Club and the Academy who supported this event. The weather was interesting with an absolute deluge on the first day accompanied by thunder and lightning! What a start – we tried 3 times to start playing but each time had to abandon the games. Thanks to the higher lawns and fast draining we were lucky to get in so many games! I would like to thank those who took part and we hope to see many more of you next year. It is a marvelous learning tournament with an opportunity to get advice from experienced coaches,and a chance to play new opponents and to have great fun! 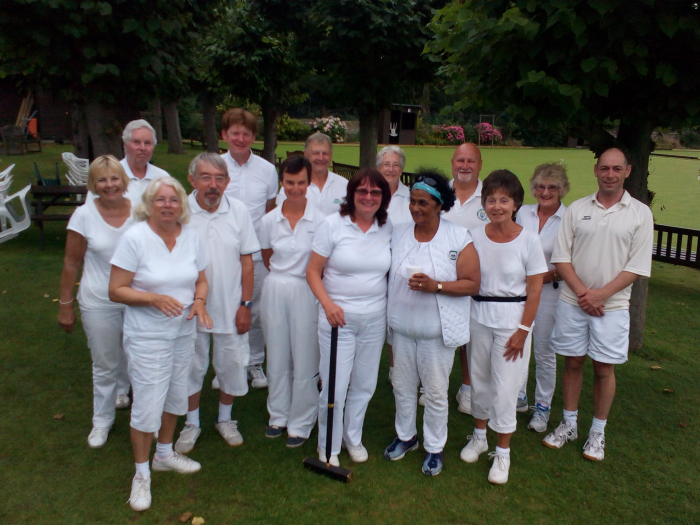 The annual High Bisque tournament was run by the Croquet Academy at Southwick on 14/15 August. There was an exceptionally good entry of 30 players with handicaps ranging from 14-26. The weather was typical  hot sunshine one minute, torrential rain the next! The players coped well with all the seasons in one day and just got on with playing! 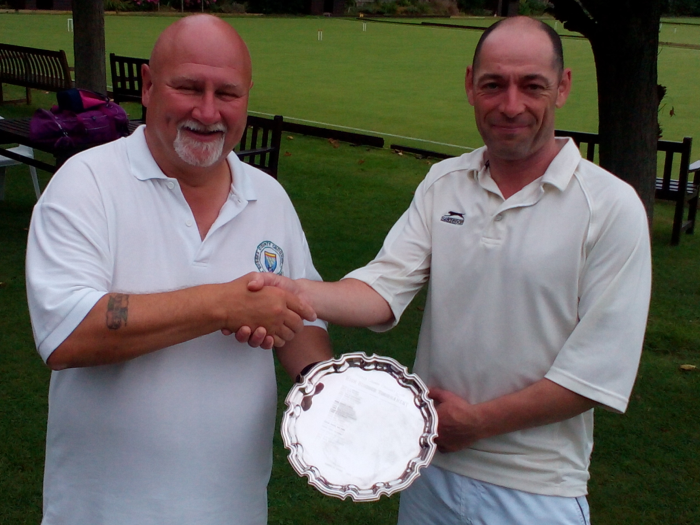 The main event, the High Bisque Salver was closely contested. Block A was won by Robin Wootton from Sussex CC, and Block B by Charles Ostler from Hunstanton. Both men won all their block games. The final took place at the end of a very tiring day and both players were tense-Robin triumphing in the end! So our chairman Jonathan Isaacs was delighted to present him with the High Bisque Salver  he also had a handicap reduction from 14 to 12. The standard of play was higher than last year in the main event with many games being pegged out. My thanks to Pat Jackson for refereeing the final. We ran 2 supervised blocks this year due to the varying nature of handicaps. The main supervised event was monitored by Jonathan Isaacs and the final resulted in a close contest. David Westall from Chelmsford narrowly beating Janet Hoptroff from Sussex CC. David pegged out in the final and had his handicap reduced from 20 to 18. The other supervised group for very high bisquers and beginners was managed by Katharine Minchin who nursed the players through their games and explained the 4 ball break thoroughly. As ever, some players did not have the shots to cope with the demands of playing a game so that is something for them to work on! We saw some very interesting and good play and it was pleasing to see many try to use their bisques affectively and set up and maintain the 4 ball break. We were delighted to welcome players from Compton for the 1st time, and parties from Hurlingham and Rottingdean. The event would not be possible without the support of our loyal coaches and I thank wholeheartedly Jack Davies, Richard Jackson, Steve Lewendon, Alan Theobald, Clive Hayton, Katharine Minchen, Pat Jackson and Jonathan Isaacs for their help and encouragement. I spent most of my time refereeing and I now know that we need a reminder of the laws for everyone in the main event before we start next year! I must also thank Janet Hoptroff, the Academy Secretary, for her patience and efficient administration, and help over the 2 days. Thanks also to Robin Wootton for his hoop setting and the division of lawn 10 into 2 short courts. We were well served as ever on the catering front by Sharon Theobald, and we remain grateful to all the volunteers who make the tournament possible. We always take on board suggestions to improve the event, so watch this space for the High Bisque event next year! An additional Golf Croquet Improvers Course will run on 28th April. I have added a number of photos from last year's cycle of coaching. We received the following extract from the Bear of Rodborough CC Newsletter. Caroline is a past student of the Croquet Academy. Caroline started learning croquet and joined this club three years ago and also joined Cheltenham Croquet Club earlier this year. Caroline started 2013 on a handicap of 20 (index 995) and ended the season on 8 (index 1322). After these and other club matches her handicap came down to 8 by late August. At Cheltenham Croquet Club this weekend, she won the D class club competition. 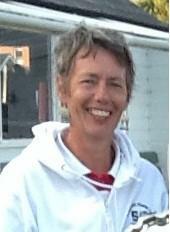 She has also played in club competitions at The Bear and has played in fixtures in the South-West Federation leagues. Of the 91 games she has played this season, she won 63 ( 69.2%) of them. Caroline will have to wait until the CA AGM in October to receive the award but in the meantime, we can all celebrate her amazing progress and wish her continued success in 2014. The Coaches Qualification Course on 12  13 April is now full. The newsletter subscription box has been removed from the website. It was felt to be no longer useful as Academy communications have been re-organised and it was unlikely further website-based newsletters would be produced. Virtually all subscribers have other connections to the Academy so they can expect to continue to receive communications from us.